We all have our vices. For some of us it’s pizza, ice cream, a bottle of wine, or even binge-watching Narcos (guilty on all charges). Our ultimate vice though presents itself in the form of a juicy, meaty patty stacked between two golden buns. The amazing thing about burgers is they’re about as diverse as the New York population and you can find them on just about any menu out there. Pop into a French bistro and it’s there, stumble into a diner and you’re sure to get your medium rare patty fix. From elevated chef creations to humble originals, burgers are being served up in all imaginable ways to fit the needs for every unique burger lover out there. Vegan, veggie, double patty, make-your-own, and so on are proving that love really does come in all shapes, sizes, and ingredients. But if you’re as devout as we are, you’ve probably already hit up all of the burger crazed spots like Near & Far Burger Bar, Superiority Burger, Boilermaker, Five Leaves, The Spotted Pig, and so on. These are just a select few of the restaurants that call their burgers their claim to fame. 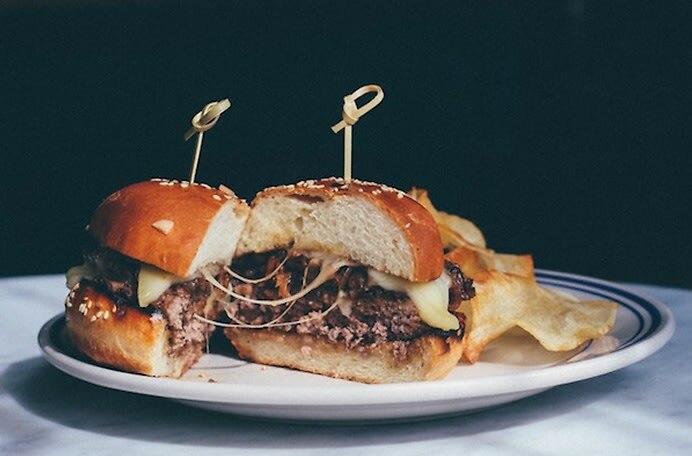 But being fans of the underdog, we took it upon ourselves to seek out some of the more underrated spots that’ll have you wondering how you’d never savored such cheesy, meaty goodness before. So rather than be a repeat offender at the nearest Shake Shack, try one, or preferably all of our modest faves for a standout burger that’ll satisfy that craving in the most unexpected way.